Jaguar Land Rover is using less than 60% of its production capacity. India's Tata Motors Ltd. said Thursday it will close one of the three Jaguar Land Rover assembly plants in England by 2014 in a bid to move its money-losing British unit into profitability. The company said it will shutter either a factory in Castle Bromwich, which makes Jaguars, or a site in Solihull, which makes Land Rover models. Both plants are in central England. Tata said a review was under way as to which of the two plants would be closed, with a decision due to be announced in the first half of 2010. 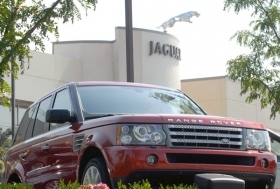 Tata bought Jaguar and Land Rover from Ford Motor Co. in 2008 for about $2.3 billion. The two premium brands have been hit hard by the global car market collapse with their unit sales falling by just over half in Tata's last fiscal quarter. Jaguar Land Rover builds luxury sports cars and premium SUVs at its three factories in England. The company employs about 5,000 workers in Solihull, 2,000 in Castle Bromwich and 1,800 in Halewood, northwest England. The company said it will consolidate the two central England factories, which are 8 miles (about 13km) apart, into one over the next five years. There will be no compulsory layoffs and new jobs will be created at the Halewood factory in 2011 when its starts building a new small SUV based on the Land Rover LRX Concept that was first shown at the 2008 Detroit auto show. Last month, Tata said vehicle sales at Jaguar Land Rover fell about 52 percent in the previous fiscal quarter from a year ago due to adverse global market conditions. The unit also made a loss before tax during the quarter of 62 million pounds ($100 million), Tata said. Jaguar Land Rover said the plant consolidation is part of a new business plan to boost the automaker's competitiveness and create sustained profitability. "This is a plan that recognizes the impact the economic collapse has had on our business," Jaguar Land Rover CEO David Smith said in a statement. Smith said "decisive actions" will see the business through the next 12 months to 18 months as markets recover and position the company to grow in the future. Smith said the economic collapse and resulting drop in new-car sales had left Jaguar Land Rover with manufacturing capacity utilization of less than 60 percent. Over the past 12 months, Jaguar Land Rover has reduced production by more than 100,000, cut 2,500 jobs and frozen pay. A union leader said it's likely that workers will oppose the factory closure. Bert Hill, regional officer for the GMB union, said it would meet with the company to hear the details of the plan. "The GMB will be opposing everything we have heard so far," he said. "We will fight the company on this - of that I have no doubt."